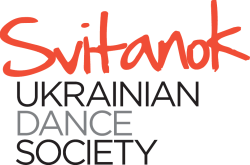 The Svitanok Ukrainian Dance Society strives towards professionalism in the training, performance, instruction, renewal, and promotion of Ukrainian character dance as a viable and developing art form on the Canadian dance scene. It was established in 1991 by Kateryna Shepertycka, Maria Shepertycka, and Yurij Ostapyk. Together, the Ottawa School of Ukrainian Dance and the Svitanok Ukrainian Dance Ensemble form the Svitanok Ukrainian Dance Society. Stay up to date with Svitanok!